The latest buzz doing the rounds in schools is multiple intelligences. Teachers are jolted by the fact that they may now have to teach differently because a new theory proclaims that there is a different method. Workshops are being organized for the teacher, for the principal, and even for parents in an attempt to explain away what might be construed a new complexity or even a hurdle to the teaching process. Having sat through some of these workshops, I would like to have a basic question answered. How do I address all these layers when teaching something as basic as the English alphabet? Howard Gardner introduced the theory of multiple intelligences back in 1983. He said that children learn in different ways, and as teachers we should foster this kind of learning. As teachers, we have always understood this intuitively and have employed different methods in introducing a particular concept so that it appeals to all the students in a class and it is easy for the student to internalize. The multiple intelligences theory is now being promoted in a big way in India. This is the most popular and fundamental approach in introducing the alphabet. Music has a universal appeal at this age and therefore by singing the letters of the alphabet, children are not only able to commit the letters to memory effortlessly, but also with enthusiasm and zeal. 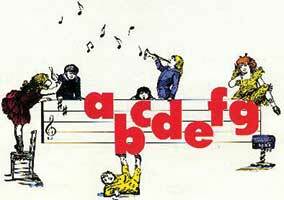 Once the alphabet is internalized, children constantly keep humming the tune or singing it. Care must be taken to sing the alphabet song at a slow pace. Many teachers make the mistake of starting off at a rapid pace and therefore most students fail to make a distinction between m and n. In fact, quite a few students assume that the letters l, m, n, and o combine to form a single letter. When students are able to sing the letters, it will be innovative to teach them to sing the reverse letters of the alphabet too. It’s a novel concept and comes in handy at the stage when students struggle to look up words in the dictionary. http://www.youtube.com/watch?v=epyQLWu0GZQ is a link to an attention grabbing audio that shows how enjoyable and challenging it can be to sing the alphabet in the reverse order. Children enjoy learning it because they end up singing it faster than adults! This is the traditional method followed in teaching the alphabet. Letters are written on the board and students are asked to trace the letters given in their book and then later to write it on their own. To make this task more interesting, students could be allowed the use of colour pencils for writing or tracing the alphabet. This makes the task less mundane and more interesting and colourful….something that children of that age group can really relate to. Just as students learn the ascending and the descending order of numbers, they learn to organize the alphabet flashcards in the correct order, working either in groups or in pairs. Flashcards can be used in lieu of worksheets and this will be a welcome change for those students who find writing a daunting and tedious chore. Students with this kind of skill will enjoy putting together a jigsaw puzzle of the alphabet and their related pictures. The market has an array of such products for children. Spread out picture flashcards around the room. Assign each student a letter and have the student match the letter to the picture. For example, the student with the letter C will need to pick up or touch the picture of the cat/cow/crow to further identify the letter. This is a methodology that helps students remember the shape and the sound of a letter. Students could also match the capital and the small letter in a similar fashion. The particularly imaginative students could also draw a picture of the object associated with that particular letter. Here is a list of easy pictures that students can draw: a bat, a cat, a drum, an egg, a fan, a girl, a hat, an ice cream, a jug, a kite, a lemon, a mouse, a nest, an orange, a pen, a queen/question mark, a rainbow, a snake, a tree, an umbrella, a van, a watch, an X, a yellow line and a zero. Make use of student drawings and ask the rest of the class to associate the picture with the letter. Alphabet blocks could be distributed to children. When the teacher calls out a letter, the child with the specific block holds it up. Using the play dough helps students internalize the alphabet. Young children ‘feel’ the letters of the alphabet and enjoy their ability to create both the capital and the small letter. For schools with a sand box, children could trace the letters in sand. Having students represent the letters of the alphabet using their fingers or their bodies is also a method of getting students to learn the alphabet. 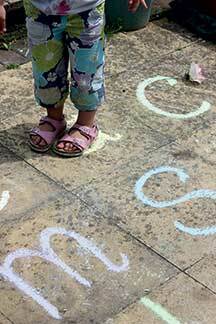 Write the letters of the alphabet on a concrete patch in the playground or outdoors anywhere. The letters can be scattered in a random order. When the letter is called out, a student can jump on the letter or run to the letter to identify it. The student takes the responsibility of deciding which approach to adopt in order to master the alphabet. 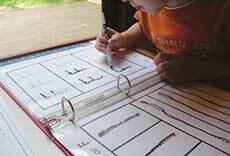 The student sings the letters, writes out the letters or uses his body to act out the letters. The student here takes total charge and follows the method that best works for him. Students can work in pairs or groups to learn the letters of the alphabet using songs, drawing or even clay modelling. This approach nurtures the ability to work in groups and get along with other people. Going to a park or even to the school playground appeals to such children. Call out a letter and ask students to identify an object that begins with the letter. Example: b for butterfly, f for flower, t for tree, etc. The innovative teacher makes certain that there is never a single approach in teaching a concept. Teaching is about a mix and match of all or nearly all the approaches. For example, while singing the alphabet song, the child could at the same time be putting together a jigsaw puzzle. The child making the letters of the alphabet from play dough could also be sharing his experience with another child or offering/receiving assistance or feedback from a group or a partner. We, as teachers, need to be aware of the different approaches so that we have the complete involvement and participation of the students. We also need to understand that we should promote as many of these intelligences as possible in all the children so that they are strong in many areas and don’t grow up with just one strong intelligence. The author is a teacher educator and language trainer based in Hyderabad. She can be reached at manaswinisridhar@gmail.com.